Pleasant Pheasant ← You Want Me To Wear What? Recently, The Hardest Working Model at ModCloth found her way to the blog. This was very exciting, if for no other reason than because it meant she was a real person, and not some hallucination I’d willed up to entertain myself while looking at some of ModCloth’s more unusual offerings. I also worried, though, that any subsequent posts I made about her and her superheroic abilities to wear strange headgear might seem like pandering. It has, at times, been harder to post about ModCloth, knowing that they read all blogs that mention their site. After all, it’s one thing when you’re shouting bitchery into the e-byss, it’s a whole other bag of nuts* when you know it’s actually being read. Then I saw this picture, and any concerns I had were assuaged. 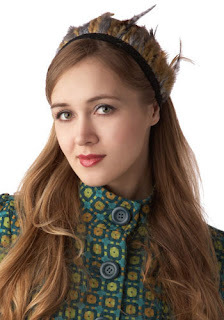 Because the Hardest Working Model at ModCloth is wearing a feathered headband, like a little demi-tribal headdress. This should be total and utter madness. This headband should be one of those “Wait, really?” moments, where you wonder if the design team is playing a trick on us. But she is so calm, so composed while wearing it, I’m lulled into submission. I accept that of course one would wear a headband covered in feathers. Why not? That seems perfectly reasonable, now that you mention it. After all, are feathers really so much stranger than anything else we put in our hair? Sometimes, I’ll put a fabric-covered rubber band in. A rubber band! By comparison, a feathered headdress seems downright normal, doesn’t it? Dammit. Her serene smile and easy confidence have lured me in once again. *Yeah, I don’t think “bag of nuts” is an expression, but I really like it, so I’m going to start using it in day to day conversation.